You can easily take a quiz by accessing the Quizzes page. Depending on how your instructor set up the quiz, questions may be shown all on one page or one at a time. If you are unable to finish a quiz you may be able to resume it at a later time. 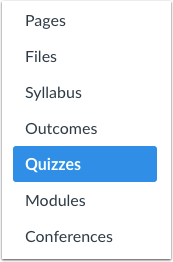 Note: Your instructor may be using an upgraded quiz tool called Quizzes.Next in your course. If the quiz you are accessing does not display in the Quizzes page, your instructor may be using Quizzes.Next. For help with taking a Quizzes.Next quiz, please see How do I take an assessment in Quizzes.Next? Find an available quiz you'd like to take and click the title of the quiz. To begin the quiz, click the Take the Quiz button. Complete the quiz per your instructor's instructions. Quizzes will either have all the questions on one page, or each question will be shown one at a time. There are several different question types in Canvas that your professors may choose to employ, from True/False to Essay format. Questions can vary by question type. Each question will show in the top right corner the point value of the question. Each question will be divided from others by a box surrounding the question and answers. 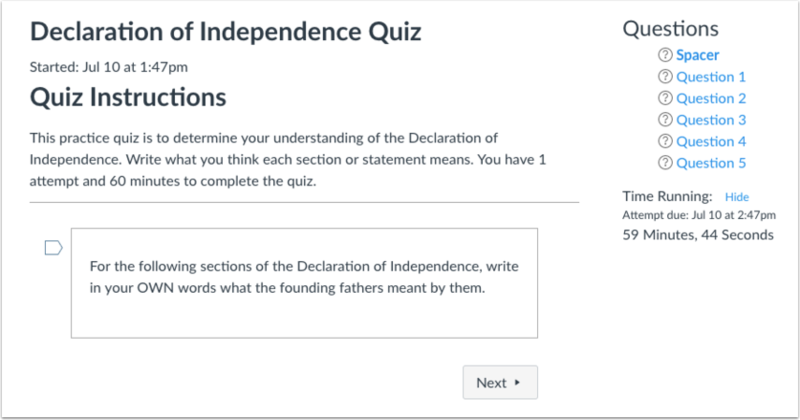 You can use other areas in the quiz to help you navigate and complete quiz questions, including the sidebar and the flagging questions feature. 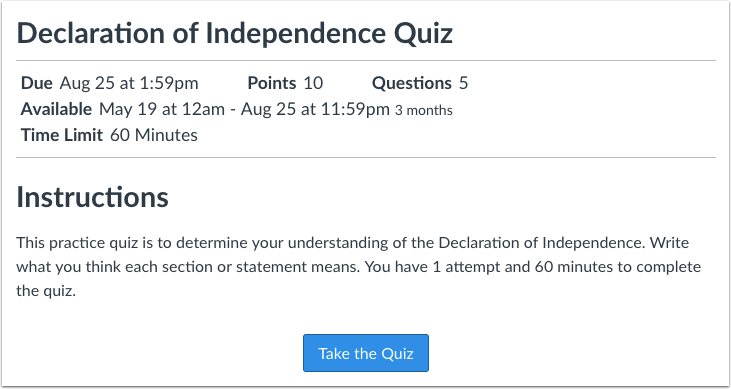 At any point during the quiz, you can view a summary of your quiz. Questions you've answered will be faded out and identified by a checkmark icon , while unanswered questions will be bolded and identified by a question mark icon . You'll also see a timer showing your progress on the quiz. For untimed quizzes , the quiz shows as the elapsed time. If you are taking a timed quiz , the timer shows the running time and counts down until time expires. You can flag the questions you want to go back to by clicking the flag by the question . The flag will change color to yellow to remind you to finish the question. The yellow flag will also appear in the question overview in the sidebar . 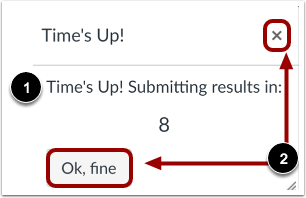 If you are taking a timed quiz, or you are taking a quiz close to the due date or lock date and time, Canvas generates warning messages to help you manage your time in the quiz. Canvas will also warn you if you lose the connection to the internet during the quiz. If you are taking a quiz with a set due date, you will see a warning popup banner as to how many minutes remain before the quiz will be marked late. Warnings appear 30 minutes prior, five minutes prior, and one minute prior. If you start a quiz near the time when it will be due, you will see a warning popup banner. Use the sidebar to view the time the quiz is due and how many minutes are remaining. In this sense, the quiz due date refers to the autosubmit date, which is either a specified lock (Available until) date or the last day of the course. Warnings appear 30 minutes prior, five minutes prior, one minute prior, and 10 seconds prior. 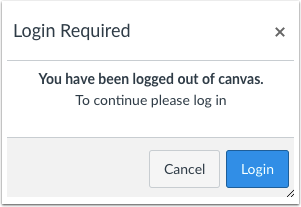 If at any time you get logged out of Canvas while taking a quiz, you will see a warning pop-up banner. To resume your quiz, click the Login button. If your browser allows you to leave the quiz, you can pause the quiz by leaving the quiz page. When you are ready to resume the quiz, the quiz will resume where you left off. If you do not submit a timed quiz before the time runs out, Canvas displays a pop-up box telling you that your quiz time has expired. The quiz automatically submits after the ten-second count down , or you can click the Ok, fine button or Close icon to submit your quiz . Previous Topic:How do I view Quizzes as a student? Next Topic:How do I take an assessment in Quizzes.Next? Table of Contents > Quizzes > How do I take a quiz? Thanks for your comment. Let us know if you ever have any questions about Canvas. We're here to help! Very helpful. I have gotten a lot out of all of this. Nice set-up. Thanks for your comment! We're glad you found this helpful. Please don't hesitate to reach out with any questions you might have in the future. We're here to help! Re: I actually have three questions, if someone could please answer all of these ASAP, that would be wonderful!